Stuart SPEAKER, AUTHOR, AND CEO. "The most critical issue facing advertisers and agencies today is marketing accountability. What...."
"The most critical issue facing advertisers and agencies today is marketing accountability. 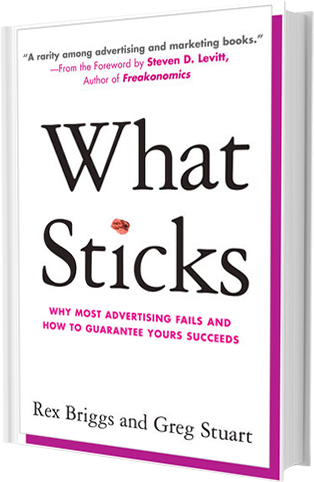 What Sticks is a clear prescriptive approach to improve your advertising results." "The marketing communications industry has undergone dramatic change over the past few decades:...."
"The marketing communications industry has undergone dramatic change over the past few decades: new technologies, increasing consumer control and the proliferation of media channels have created a marketing landscape with many potential potholes and wrong turns. Rex Briggs and Greg Stuart have created a smart road map for navigating this rough terrain, providing the do’s and don’ts of maximizing ROI." "I used the research and approach outlined in What Sticks in a brand I...."
"I used the research and approach outlined in What Sticks in a brand I managed and drastically improved the impact of our advertising as a result. This is a great book and approach, and one that is completely new. In order to stay competitive, I expect every marketer will have to read this book." "Nothing gets the attention of our CMO clients today like the issue of marketing accountability....."
"Nothing gets the attention of our CMO clients today like the issue of marketing accountability. What Sticks has a clear and innovative solution for marketers of all levels and budgets to get more Bang! for the buck." "I conducted this research for one of our Brands and it...."
"I conducted this research for one of our Brands and it dramatically changed the way we looked at our advertising and advertising process." Bob Liodice, President and Chief Executive Officer, Association of National Advertisers, Inc.
"If there is one book you want to have read about advertising, it’s What Sticks....."
"If there is one book you want to have read about advertising, it’s What Sticks. It is the most comprehensive review of how to succeed at developing Advertising campaigns that I’ve ever seen."